Press Reports - PROTECT FARMWORKERS NOW! Yakima Herald September 13: "Relief"
The Lynden Tribune reported on the August 5 worker march and, while giving considerable space to the false claims, also thankfully reported the fact that these claims are false. 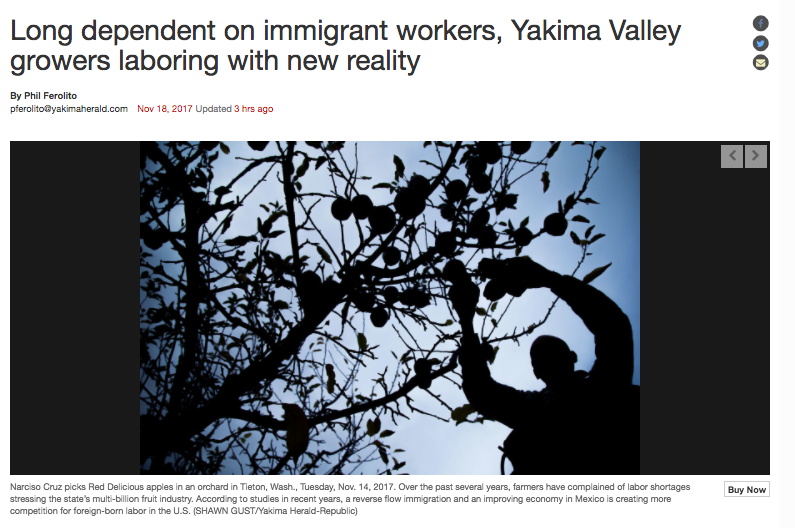 Yakima Herald reports on issues involving the current guest worker program and the need for significant improvements. The proposed changes will not only benefit farmers who need the workers, but workers who need the jobs and consumers who prefer the safer, more environmentally-friendly US grown food. This is a guest column by Dillon Honcoop, who grew up on a Lynden-area raspberry farm and now works for Save Family Farming as coordinator of the Protect Farmworkers Now project. An exhaustive Washington Department of Labor & Industries investigation reported that the farm was in no way responsible for Mr. Silva Ibarra’s death, but that truth is apparently an inconvenient one for activist labor groups like Bellingham-based Community to Community Development, which wanted to capitalize on news coverage of the tragedy to further their labor organizing efforts. They have falsely claimed that “degraded conditions” and management failure caused Mr. Silva Ibarra’s death, going so far as to label it “corporate murder,” and continuing to do so even after L&I’s investigation proved them wrong. A recent letter to the Tribune from a concerned citizen perhaps inadvertently continues this pervasive lie. “A young H2A worker died due to poor working conditions and management oversight,” Naomi Murphy wrote in the letter printed May 9. It’s one thing to express genuine concern for the workers, it’s another to continue to make false statements when the truth is out there for all to see. Either Ms. Murphy is entirely ignorant of the facts of the tragedy or she’s intentionally communicating false and harmful accusations. It’s deeply troubling that activist labor groups continue to claim in interviews, social media, website posts and elsewhere that, among other mistreatment of workers the Sumas farm caused the worker’s death. Their pressure on Labor & Industries and publicity they generated caused the department to issue a fine 40 times greater than one normally assessed for rest and meal break violations. It is shameful for a department to punish a farm based on lies communicated about them, especially when they themselves determined the accusations to be lies! The H-2A program, despite activists’ claims that it amounts to “virtual slavery,” provides some of the best worker protections anywhere, including good wages, subsidized meals, and free housing and transportation. The employer has to make sure that the worker returns home after completing the work. If a worker can go from one farm to another, the employer can’t be expected to pay for transportation and housing, and prevention of illegal immigration becomes impossible. The activists seek to establish farmworker unions. It’s a free country and people can pursue whatever agenda they want. But this agenda hurts workers because it takes away jobs they very much need, hurts consumers by rapidly increasing the amount of food we import, and hurts farmers through the vicious lies and political pressure. Workers are exceptionally well protected, as the massive fine against the farm for break violations shows. What other business do you know would be fined $150,000 for a few late rest or meal breaks? It’s time for those who care about these farmworkers to tell Community to Community, the activist group behind this, that enough is enough. A self-described anti-capitalist organization has revived discredited claims that a Whatcom County, Wash., berry farm caused a Mexican worker’s death last summer. The group is seeking to rally opposition to hiring foreign farmworkers and support for a consumer boycott. L&I investigators, responding at least in part to accusations posted on Facebook, exonerated the farm in Ibarra’s death. A spokesman for the agency said workers were provided water, shade and heat-illness training. The investigation did find that workers missed one rest break and were served one meal late in late July. The company was fined a total of $149,800 by the state and Whatcom County. Mother Jones has never pretended to provide balanced journalism, but this article on the lawsuit against Sarbanand shows the reporter and editor are eager to be a mouthpiece for those trying to take these important jobs from farm workers. The allegations of Rosalinda Guillen of Community2Community and Columbia Law Center are repeated as if they were facts. They are not. Workers who abandon their jobs are breaking their contract and after five days the farmer is no longer required under the contract to continue to provide free housing. The worker action, prompted by the activists not the workers, began well before anyone became ill – not as a result of the illness. We find it interesting that the reporter included the fact that the worker died of natural causes, not because of what activists accuse the farmer of, but buried it near the bottom of the story. We also find it interesting that while we made the point to the reporter that if the activists their lawyers had evidence that the farmer in any way caused the workers death as has been so widely repeated, why would that not appear in the lawsuit. If they discovered there was no evidence, isn't an apology in order? Washington Growers League's 144 bed facility will be open to workers by April. In 1970, the Mexican-born population in the U.S. was less than a million, but the number swelled to a peak of 12.8 million in 2007, according to a 2015 study by the Washington D.C.-based Pew Research Center. Now a reverse trend is occurring, with more leaving than arriving. In 2014, the Mexican-born population declined by more than a million, to 11.7 million. The decline is most visible in unauthorized arrivals, which had dropped to 5.6 million in 2014 after a peak of 6.9 million in 2007, the report said. A study by professors of agricultural economics at University of California, Davis, pegged Mexico’s annual per-capita salary at $15,000, about $7,000 less than the average salary of a picker in the Yakima Valley. Laborers in the Yakima Valley earn a median hourly wage of $13.16. Some earn more doing piece work, earning anywhere from $20 to $28 for each bin of apples picked. An average picker can complete six or seven bins a day while a fast picker can complete 10 or more, Saunders said. Some growers are relying more on the H-2A guest worker program that provides immigrants temporary work permits. In 2015, more than 12,000 of the state’s 96,000 farm laborers were obtained through the H-2A program, according to Employment Security’s most recent annual agricultural workforce report. Saunders doesn’t use the H-2A program because of the additional costs associated with it. 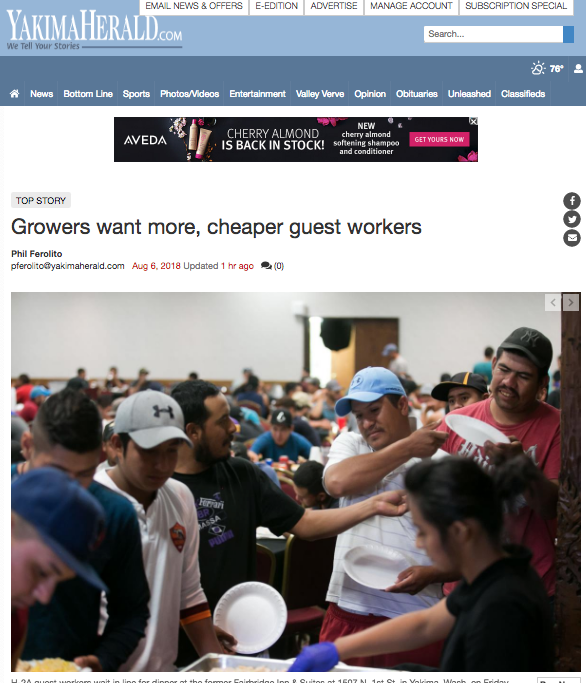 Growers have to provide workers with housing, transportation and premium wages. He estimates using the H-2A program would cost him anywhere from $15,000 to $20,000 per worker the first year in startup costs. That doesn’t include wages and the annual cost of transportation, meals and housing maintenance each year. “You have to build housing, restrooms, kitchen facilities and buy buses,” he said. Consider two workers. One is an immigrant farmworker. He left his family and country behind, and is struggling with a new language and a new culture in the hopes of building a better life, one that is not available in his home country. The other worker remains in the country where he grew up. Although his prospects for earning are less, he wants to stay with his family, his own culture and language. Instead of migrating, he wants to share what he produces with American consumers through trade. For the environmental left, the first person is warmly embraced, but the second is treated as an enemy. In contrast, the free market and respect for voluntary exchange between people, no matter where they live, is at the heart of the Washington Policy Center’s environmental approach. It is better for people, and better for the environment. Legal immigration is positive for Washington state and for our farmers. This year, the Washington Farm Labor Association analyzed the benefits of H-2A visa workers on Washington’s economy. It found that even after immigrants sent money home, the benefit to Washington state was about $5,000 per worker. Immigration is critical to our agricultural prosperity. Washington is one of the nation’s largest producers of apples and pears and these workers ensure produce gets to market. As we noted in a recent study, 51 percent of farms reported economic damage due to labor problems, including a shortage of workers. Immigrants also embrace the American Dream. I ran a charity that worked with farmworkers and was constantly inspired by their commitment to hard work and prosperity. At a time when some Americans denigrate that ideal, these workers embody it. Trade is equally important for Washington’s economy. Unfortunately, some people want to block trade, harming our economy and opportunities for the poor in other countries. Take, for example, this comment: “NAFTA has had a devastating impact on workers in our country.” These are the words of Washington environmental activists at their recent conference in Olympia. The data, quite simply, show otherwise. Washington’s farmers, Microsoft programmers and electric vehicle part manufacturers all prosper because we can share our products and creativity with the world. In exchange, we receive the benefit of goods from every culture and corner of the globe. This is obviously good for Washington’s economy. It is also good for people in developing countries and for the environment. Trade protectionism harms the poorest across the globe. Nobel Prize winner Muhammad Yunus notes, “Protectionism is built up in each nation in the name of the poor, but its real beneficiaries are the rich and clever people who know how to manipulate the system.” Those who oppose trade claim to care about the poor, but trade barriers are more often used as weapons against the poor. Trade also helps the environment. Environmental activists point to China’s spending on “green” technologies. Ironically, they also attack the prosperity-creating free-trade policies that allowed the Chinese to make those investments. The more prosperous a country becomes, the better its environmental record. The environmental left is quick to tell you they care about immigrants. A worker or small entrepreneur who stays in their own country, however, is denigrated. Their decision to stay with their family and culture is not respected by those who attack free trade, blocking their opportunity to prosper in a way they choose. They respect immigration only when immigrants give everything up to live by the left’s rules. That is not compassion. It is coercion. Legal immigration and trade are not merely a benefit to Washington state – creating jobs and economic prosperity. They also help the environment, by allowing us to use our resources efficiently and generate the prosperity that is critical to a clean environment. Perhaps most of all, allowing people to work and trade together in a way that is mutually beneficial is more moral than the coercive approach of the left. Trade, within our borders or across them, benefits our economy, helps the environment and is respectful of people who understand the American Dream of a better life is a universal dream. Todd Myers is the environmental director for the Washington Policy Center. AgInfo.net reaches farming communities throughout most of the western US through 89 radio stations. March 12 edition of Daily Sun News in Sunnyside reported on the letter Save Family Farming sent to the Secretary of Labor protesting the February 27 press release issued by the Department. Save Family Farming is working to bring the Secretary's attention to actions by his staff that appear politically motivated to support the efforts of union activists calling for an end to the guest worker program. Several news reports showed that the DOL staff was playing politics – attempting to gain publicity for alleged violations against a Skagit berry farm that took place five years earlier! As part of our organizing efforts, we have linked the cause of migrant workers to other issues, including climate change, immigration reform, and racial justice. Adopting this strategy has made us stronger, and proved essential to our success. As part of our organizing efforts, we have linked the cause of migrant workers to other issues, including climate change, immigration reform, and racial justice. Take the role of race. Historically, many settlers came to the Oregon Territory (now Washington, Oregon, Idaho, and parts of Montana and Wyoming) with the intention of setting up some sort of white utopia. Their racism was codified in the laws that forced nonwhites out of town at sunset. In the 1920s, the Ku Klux Klan held a rally of more than 10,000 people in Bellingham, where I live. But although the Northwest remains very much a white space (and breeding ground for white supremacist ideology), people of color and indigenous peoples exist here—and we are organizing for dignity in the workplace and political power. ​The number of H-2A-visa foreign guestworkers approved for U.S. farms continues to grow by 20 percent a year, and eventually the need will accelerate and the system will crash, a leading farm spokesman predicts. The U.S. Department of Labor approved 200,049 H-2A-visa foreign guestworkers for U.S. farms in fiscal year 2017, up 20.7 percent from 165,741 in 2016. “It’s the kind of growth we expected. It would have been more. If there hadn’t been a late frost and hail in South Carolina and Georgia, it would have been closer to 205,000 or 210,000,” said Frank Gasperini Jr., executive vice president of the National Council for Agricultural Employers in Washington, D.C.
“We have a continuing labor shortage and at some point it will reach a steeper incline because workers are getting older and H-2A is the only replacement,” Gasperini said. “We are not raising up new domestic workers in agriculture, construction, hospitals or hotels. We will have fewer people doing that type of work and with our borders tighter than ever, foreign guestworkers are the only relief valve,” he said. At some point the system will crash because government agencies are not equipped to handle the increased volume, he said. Agencies are staffed for year-round work, not seasonal peaks, he said. Mechanization isn’t the total answer because the U.S. grows and exports more food every year, Gasperini said. That will cause, even with increased mechanization, demand for labor to go up, he said. “As Congress looks at H-2C (to replace H-2A), mandatory E-verify (electronic employment eligibility) and possibly other initiatives, they need to be aware of this growth and make sure government departments responsible for administering these visa programs are ready for the growth. They barely keep up now,” said Kerry Scott, program manager of masLabor, Lovingston, Va., the largest provider of temporary H-2A agricultural and H-2B nonagricultural workers in the nation. The 200,049 H-2A visas authorized by DOL in 2017 was 6,107 fewer than the number requested, according to DOL. The number of authorized H-2A visas has been increasing by 18 to 20 percent for several years. There were 139,832 H-2A visas approved in 2015, 116,689 in 2014 and 98,821 in 2013, according to DOL. Generally, about 90 percent of those authorizations become actual workers, Gasperini said. H-2A workers are about 10 percent of the nation’s more than 2 million seasonal ag workers, he said. That’s more than doubled in the last five years, he said. Year-round or permanent ag worker are about another 500,000, he said. The latest DOL numbers show Florida leading in 2017 H-2A workers at 25,303, up 12.6 percent. Georgia is second at 23,421, up 11.7 percent. North Carolina is third at 20,713, up 10.4 percent. Washington is fourth at 18,535, up 9.3 percent. California is fifth at 15,232, up 7.6 percent. After that, Louisiana, Kentucky, New York, Michigan and Arizona round out the top 10 states. “Florida, Washington and Michigan see higher growth because whole crops are starting to shift in a big way to H-2A because of lesser migrant movement,” Gasperini said. A listing of top 10 employers hiring H-2A workers shows the North Carolina Growers Association No. 1 at 11,947 workers, up 6 percent. The Washington farm labor association WAFLA is No. 2 at 7,134, up 3.6 percent. Fresh Harvest Inc., part of the Scaroni Family of Companies in Heber, Calif., is third at 4,623, up 2.3 percent. Zirkle Fruit Company, Selah, Wash., is fourth at 2,970, up 1.5 percent. Elkhorn Packing Co. LLC, Salinas, Calif., is fifth at 2,653, up 1.3 percent. The bottom five are headed by Stemilt AgServices LLC, Wenatchee, Wash., sixth at 2,082, up 1 percent. R&R Harvesting Inc., LaBelle, Fla., is seventh at 1,999, up 1 percent. Foothill Packing Inc., also Salinas, Calif., is No. 8 at 1,854, up .9 percent. Peri & Sons Farms Inc., Yerington, Nev., is ninth at 1,739, up .9 percent and Virginia Agricultural Growers Assoc. Inc., is 10th at 1,602, up .8 percent. A breakdown of 2017 H-2A workers by crops or occupation shows berries No. 1 at 21,946 workers, up 11 percent. Apples is No. 2 at 12,697, up 6.3 percent. Tobacco is third at 12,534, also up 6.3 percent. Fruits and vegetables fourth at 12,465, up 6.2 percent and general farmworkers at 12,037, up 6 percent. That is followed by melons, corn, peppers, sweet potatoes and hay and straw. OROVILLE, Wash. — As the minimum wage for H-2A-visa foreign agricultural workers goes up 74 cents per hour in Washington and Oregon, a small tree fruit grower in this U.S.-Canadian border town says it’s just one more factor jeopardizing his survival. “I’m filling out my H-2A application for next year right now as we speak. It has me nervous. I don’t know when it ends. It’s a minimum so I have to reward workers with experience and better skills by paying them more than that,” says Dave Taber, owner-operator of about 275 acres of apples, pears and cherries. The H-2A minimum wage in 2018 for Washington and Oregon is $14.12 per hour, up 5.53 percent from $13.38 this year. The two states fall from highest to second highest in the nation. Hawaii is the new No. 1 at $14.37 per hour. Taber hired 30 H-2A workers last year and this year plans to have 45. For the first time, he’s hiring some for winter pruning and spring planting. “It’s just making our cost of labor go up and it’s that much more difficult to get returns to cover that. You’d better have the right varieties, quality, yields and warehouses to stay in business and I’m not sure if I do or not,” Taber said. The U.S. Department of Labor on Dec. 21, released the Adverse Effect Wage Rates (AEWRs) for all regions of the country for 2018. They are the same as what USDA’s National Agricultural Statistics Service released in November based on a survey of prevailing wages of field and livestock workers by region across the nation. They are minimum hourly rates for H-2A-visa workers, usually above state minimum wages, and intended to be high enough that the pay ofdomestic workers is not adversely affected. An employer who hires H-2A workers is required to pay a minimum of the AEWR to any domestic workers also under his or her employ. AEWR increases push all wages up, increasing costs, growers say. California goes up 4.85 percent, from $12.57 to $13.38. Idaho and Wyoming wages go down 3 cents from $11.66 to $11.63. Nevada and Colorado go down 2.82 percent from $11 to $10.69 and Arizona is down 4.47 percent from $10.95 to $10.46. Washington tree fruit growers pay piece rates for harvest that generally run the equivalent of $20 per hour and more for fast pickers. Dan Fazio, executive director of the farm labor association WAFLA, said expense is a major grower complaint about H-2A. Some vegetable farmers have quit using it because they can’t afford it, he said. Beside the high minimum wage, employers have to provide worker housing and pay transportation for the workers from and back to their country of origin, predominantly Mexico. Labor shortages are driving up wages but not creating more workers, he said. DOL approved 200,049 H-2A workers for U.S. farms in 2017, up 20.7 percent from 2016 and about 10 percent of the nation’s more than 2 million seasonal ag workers, according the National Council of Agricultural Employers in Washington, D.C.
DOL approved 18,535 H-2A workers for Washington state in 2017, up 9.3 percent. California was at 15,232, up 7.6 percent. Oregon and Idaho were not available but have far fewer. 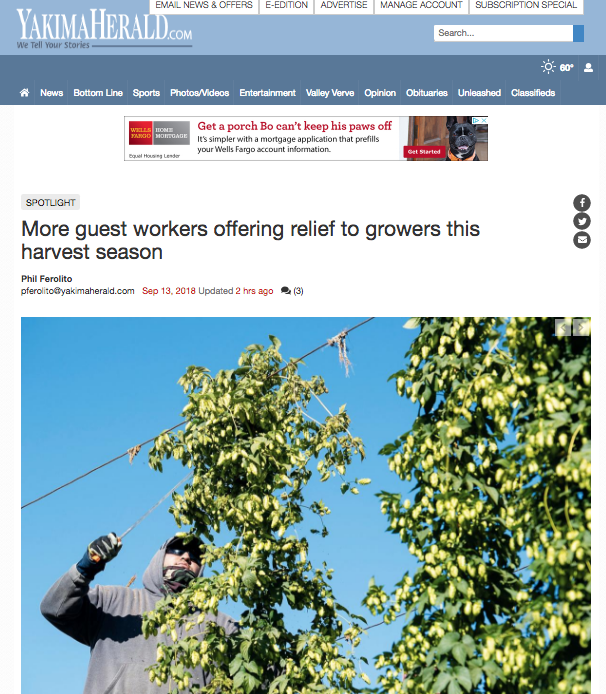 CALDWELL, Idaho — As the available labor pool in Southern Idaho continues to shrink, a lot more farmers are turning to the H-2A guest worker program to fill their employment needs. The number of agricultural producers in Idaho who use H-2A workers could increase significantly in coming years, said Jennifer Uranga, who owns and manages Mountain West Ag Consulting, which specializes in H-2A issues. Total applications from Idaho agricultural businesses seeking H-2A workers increased 32 percent from fiscal year 2015 to 2017, according to the Idaho Department of Labor. Most of those applications were from Southern Idaho producers. The only thing stopping that explosion for the moment is a lack of housing in the region, Uranga and farm business managers that use H-2A labor told Capital Press. Businesses that bring in foreign workers under the H-2A program are required to provide them housing. Idaho ranked No. 3 in the nation with 497 total H-2A applications in fiscal year 2016, behind Kentucky (1.125) and Louisiana (799), according to the U.S. Department of Labor. The tight farm labor situation in southern Idaho was a major focus during the Idaho State Horticultural Society’s annual meeting in Nampa last week. The tight labor pool in Southern Idaho is the result of a couple factors, said Chad Henggeler, field manager for Henggeler Packing Co., one of the state’s largest fruit orchards. The state’s unemployment rate was a historically low 2.8 percent in September and a lot of labor-intensive farm commodities such as wine grapes, fruit, hops and seed crops are produced in the region. The pool of available workers has declined at least 10 percent each of the past four years, said Jamie Mertz, co-owner of Symms Fruit Ranch. Like Henggeler, Symms turned to the H-2A program two years ago and had about 70 guest workers this year. “If we didn’t have them, it would be devastating, quite honestly,” Mertz said. During the horticultural society meeting, farms were encouraged to explore sharing H-2A contracts to reduce costs. “I think one of the focuses of the future is that we try to work with other commodities and other growers to try to share workers so we can afford to bring them in,” Henggeler said.